"MoO 2" redirects here. For the chemical MoO2, see Molybdenum dioxide. Master of Orion II: Battle at Antares is a 4X turn-based strategy game set in space, designed by Steve Barcia and Ken Burd, and developed by Simtex, who developed its predecessor Master of Orion. The PC version was published by MicroProse in 1996, and the Apple Macintosh version a year later by MacSoft, in partnership with MicroProse. The game has retained a large fan base, and is still played online. Master of Orion II won the Origins Award for Best Fantasy or Science Fiction Computer Game of 1996, and was well received by critics, although reviewers differed about which aspects they liked and disliked. It is used as a yardstick in reviews of more recent space-based 4X games. 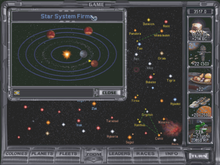 The main screen: the pop-up window displays information about a specific star system, while the large window under it displays the galaxy as a whole. Master of Orion II is more complex than the original game, providing more gameplay options for the player. Three new alien races have been added, and there is the option for players to design and add their own race. Instead of the one planet per star system found in the original there are now multiplanet star systems that can be shared with opponents. Spaceships can now engage in combat, marines can board enemy ships, and planets can be blown up. Multiplayer mode includes one-on-one matches and games with up to eight players. Victory can be gained by military or diplomatic means. Major elements of the game's strategy include the design of custom races and the need to balance the requirements for food, production, cash and research. The user interface provides a central screen for most economic management and other screens that control research, diplomacy, ship movement, combat and warship design. The most desirable systems are usually guarded by space monsters, much less powerful than Orion's Guardian but still a severe challenge in the early game, when fleets are small and low-technology. Ships can travel to any star system within their range,:30–31 unlike games such as Space Empires or Master of Orion III, in which interstellar travel is possible only or mainly via "wormholes" and it is possible to set up easily defended choke points. Master of Orion II provides 13 pre-defined playable races,:16–21 three of which are additions to those available in Master of Orion. The game also allows players to create custom races,:132 and a group of enthusiasts regard race design as a crucial element of strategy. Each player starts with ten "picks" (race design points). Choosing advantageous traits reduces the number of picks available, while choosing disadvantages increases them, but players cannot choose more than ten picks' worth of disadvantages. Most of the options are major or minor advantages and minor disadvantages in farming, industry, research, population growth, money, space combat, espionage and ground combat. :16–24 The race design system also offers "special abilities" that have various effects on various aspects of their effectiveness. Colony List, with sort buttons along the bottom. The cursor (hand) on the right is about to open a colony's Build Menu. The game was designed by Steve Barcia and Ken Burd,:153 and developed by Barcia's company Simtex, which had previously developed Master of Orion, published in 1993 by MicroProse. For Master of Orion II, Simtex provided additional pre-defined races, the option to create custom races, and multiplayer options. The first "Orion" game's graphics had also been heavily criticized, and the second included higher-quality artwork displayed at a higher resolution. The main contributions were: design by Steve Barcia (lead designer), programming by Ken Burd (lead programmer) and five others; art by Dave Lawell (lead artist) and eight others; music by Laura Barratt; sound by John Henke. In June 1995, MicroProse agreed to buy Simtex, and turned it into an internal development division. The acquisition continued to be known as "Simtex Software", and the Simtex logo appears briefly before MicroProse's while MOO II is loading. MicroProse released Master of Orion II: Battle at Antares for IBM-compatible PCs in 1996, and an Apple Macintosh version was published a year later by MicroProse in partnership with MacSoft. Master of Orion II secured 10th place on PC Data's computer game sales chart for the month of November 1996. It remained in the top 20 for the next two months, in positions 17 and 20, respectively. By mid-January 1997, its global sales has surpassed 200,000 copies. Reviews were generally favorable, and the game won the Origins Award for Best Fantasy or Science Fiction Computer Game of 1996. However, reviewers differed in regard to the new gameplay features and micromanagement. B. Geryk preferred the simpler approach of Master of Orion, while Tom Chick found the gameplay easy to manage and much more engaging than Master of Orion. Robert Mayer of Strategy Plus argued that the concepts are good but the interface makes it needlessly difficult to access information vital to managing them. GameSpot's Trent Ward said the game's micromanagement is "everything that the hard-core veteran dreams of", but noted that strategy game novices would find it inaccessible. Offering yet another opinion, Next Generation found the difference from Master of Orion to be minor, concluding that "perhaps the biggest problem is that the game is a little too stagnant, and doesn't really break new ground in the now-crowded galactic conquest genre." Reviewers criticized that the race traits are unbalanced, with "creative" in particular being overpowered, but praised the replay value provided by the wide range of galaxies, races and other options. Macworld's Michael Gowan wrote that Master of Orion II's "countless strategy options will keep you coming back for more." Complaints that the loading of artwork from CD made the game run slowly led to recommendations to download the entire CD onto hard disk before play. Cale Corbett, reviewing the Mac version, complained that the user interface was "clunky", as it lacked features common in programs originally developed for the Mac. Master of Orion II was a finalist for the Computer Game Developers Conference's 1996 "Best Strategy/War Game" Spotlight Award, but lost the prize to Command & Conquer: Red Alert. It was also nominated as Computer Games Strategy Plus's 1996 turn-based strategy game of the year, although it lost to Civilization II. The game was a finalist for Computer Gaming World's 1996 "Strategy Game of the Year" award, again losing to Civilization II. Master of Orion II was named the 39th best computer game ever by PC Gamer UK in 1997. The Master of Orion series set a new standard for space-based 4X games, with a retrospective review describing it as "a towering monolith in the genre that has cast an eight-year-long shadow over everything that's followed... Master of Orion is still the definitive name in space opera games". In the same review, Chick added that Master of Orion II and its predecessor Master of Orion "loom large" in any discussion of science fiction strategy games. Master of Orion II has both influenced the subsequent development of such games and invited comparisons in reviews, with a 2006 GameSpot review describing it as "the pinnacle of the genre". Other games have been noted for their similarities and differences with Master of Orion II. One review of Space Empires IV made several comparisons with Master of Orion II, commenting favorably on the complex tactical combat, while criticizing the relatively "sparse graphics and sound", concluding that it was the most sophisticated game available in the genre, but that it built "on the basic foundation of Master of Orion" instead of "breaking new ground". Other games which have been compared with Master of Orion II include Galactic Civilizations II, which James Lombardi praised as standing "proudly next to its famed predecessor" (although it "did not include the tactical battle option like Masters of Orion II"), and Lost Empire: Immortals, whose scale was criticised as "soulless" (relative to Masters of Orion) by Jason Ocampo. ^ a b c d e f g h i j k l m n o p q r s t Master of Orion II: Battle at Antares. Microprose. 1996. ^ a b c d e f g Ward, T. C. (November 27, 1996). "Master of Orion II: Battle at Antares Review". CBS Interactive. Archived from the original on January 23, 2013. Retrieved January 22, 2012. ^ a b c Donks, Alex (July 20, 2010). "How I Gained and Lost an Empire". The Escapist. Retrieved March 13, 2012. ^ a b Master of Orion: Battle at Antares. PC Magazine. March 4, 1997. p. 369. ISSN 0888-8507. Retrieved March 12, 2012. ^ a b c d Mayer, R. (1997). "Master of Orion II: Battle at Antares". Strategy Plus. Archived from the original on April 18, 2005. Retrieved May 9, 2009. ^ a b c d e f g h i Chick, T. (2001). "PC Retroview: Master of Orion II". IGN Entertainment. Retrieved May 9, 2009. ^ a b c d e f g h i j k l m n o p q r s t u v w x y z aa ab Possidente, John; Ellis, David (November 20, 1996). Master of Orion 2. Prima Pub. ISBN 978-0-7615-0273-9. ^ a b Geryk, B. (November 28, 2000). "Space Empires: IV (PC)". GameSpot. CBS Interactive. Retrieved May 9, 2009. ^ Wood, A. (2004). "Master of Orion III (PC)". Daily Game. Archived from the original on December 5, 2006. Retrieved May 9, 2009. ^ "Master of Orion II Online: Strategy Guide". Cybersaber. 2005. Retrieved May 11, 2009. ^ a b c d e Meinfelder, E. (1997). "Rule the Galaxy for $50". InfoMedia, Inc. Archived from the original on November 14, 2006. Retrieved May 9, 2009. ^ "Master of Orion II: Battle at Antares Tech Info". CBS Interactive. Retrieved March 13, 2012. ^ "SEC Info – Microprose Inc/DE – 10-Q – For June 30, 1998". Fran Finnegan & Company. Retrieved June 8, 2009. ^ "GameSpy Company Bio: Microprose". Retrieved May 9, 2009. ^ Bauman, Steve (January 15, 1997). "Ch-ching - Westwood cashes in". Computer Games Strategy Plus. Archived from the original on June 15, 1997. ^ "Master of Orion II: Battle at Antares". GameRankings. Retrieved January 22, 2012. ^ a b "Master of Orion II: Battle at Antares". Metacritic. Retrieved May 9, 2009. ^ a b c Gowan, Michael (February 1999). "Name Your Game; From Goofy to Gory, Macworld Reviews 48 Ways to Play". Macworld. Archived from the original on August 10, 2001. ^ a b c "Master of Orion II". Next Generation. No. 28. Imagine Media. April 1997. p. 128. ^ "Origins Awards for 1996". Archived from the original on May 7, 2008. Retrieved May 9, 2009. ^ a b Geryk, B. (August 8, 2001). "History of Space Empire Games – Master of Orion II: Battle at Antares". GameSpot. CBS Interactive. Archived from the original on March 12, 2007. Retrieved January 22, 2012. ^ Corbett, C. "Master of Orion II (Mac)". Dimension Z Online. Retrieved May 11, 2009. ^ Staff (March 25, 1997). "Computer Games Strategy Plus announces 1996 Awards". Computer Games Strategy Plus. Archived from the original on June 14, 1997. Retrieved November 2, 2010. ^ "Galactic Civilizations II: Dread Lords Hands-On – The Spiritual Heir to Master of Orion II?". GameSpot. Yahoo! Video Games. Archived from the original on July 16, 2011. Retrieved January 22, 2012. ^ Lombardi, J. (March 7, 2006). "Galactic Civilizations II – Game Review (PC)". Armchair General L.L.C. Retrieved May 9, 2009. ^ Ocampo, J. (April 11, 2008). "Lost Empire: Immortals". IGN Entertainment. Retrieved May 9, 2009. Strategies for Master of Orion II. Crown Publishing Group. September 1, 1996. ISBN 978-0-7615-0919-6. A personal development account by Terry Greer one of the game's artists on the game's creation. This page was last edited on 28 March 2019, at 22:27 (UTC).